Over the course of the planned change of use of the former main post office from a call centre/ticketing office to a retail space, assessments were conducted on how to satisfy the business requirement for optimised display window frontage and to achieve the best retail access to the building. How can the historic Kornmarkt façade showcase itself in future while being mindful of historical conservation issues and functionally necessary features? 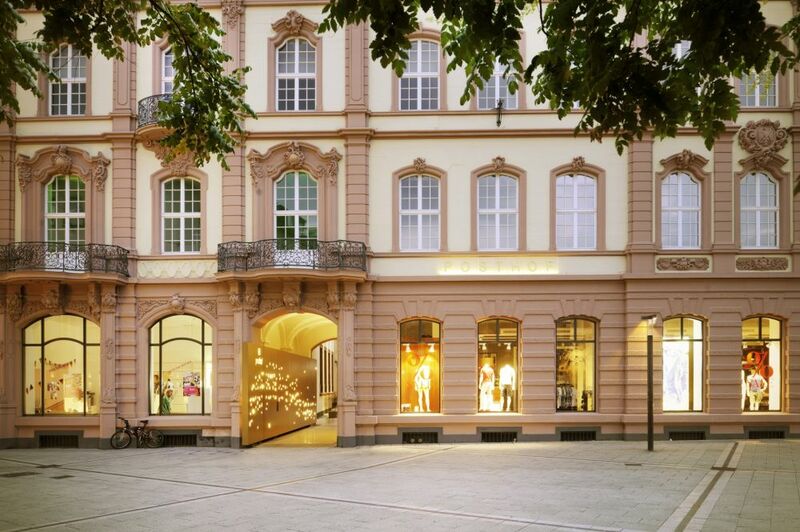 In order to fulfil the desire, also that of the city of Trier, for a multifaceted, high-quality and sustainable retail concept, the window frontage is brought closer to customers via a lowered balustrade. All the ground floor windows, including the telecom shop windows, will see their balustrades lowered by 50 cm. The rebuilding of the continuous, plinth-bordering window sill involves reconstituting as many original parts as possible and substituting any others appropriately and correctly. The change in the opening size of the ground-floor windows raises the question of the type of window partitions the Kornmarkt façade should feature. Once again, ostensible historical conservation issues should be taken into account, but the functional requirements associated with a building use that is both contemporary and characteristic must also be accommodated. 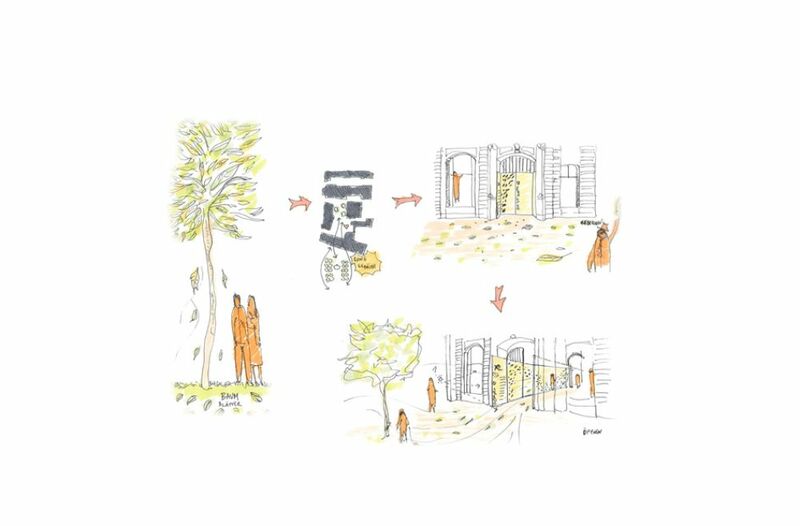 The different historical periods of the former post directorate, respectively the main post office, were analysed with the help of photographic documents and excerpts from the book of monuments of the city of Trier. It became obvious that the present window partitions were created as recently as the 1980s. Since its erection in 1879, the building has undergone various renovations and extensions, in each case accompanied by new partitions and, as a result, new window openings or window formats. Individual elements were adapted to the period so as to achieve an overall picture that corresponded to the era and use of the time. The present, small-structured window partition is not historically justified, but at best a reflection of history and hardly beneficial for the desired use as retail space. By breaking away from the conventional idea that the treatment of existing historical buildings goes hand in hand with the use of sash windows, however, room is created for an interesting interaction between old and new. The newly created display windows yield to the overall façade and are within the context of the existing historical building. The formerly unwelcoming Kornmarkt façade becomes part of the square, which undergoes a visual extension as a result. In close alignment with the lower and upper historical preservation, the display windows on the ground floor were consequently designed to be largely sashless. A vertical partition was created solely for the window openings spanning the portal width under incorporation of the window lines of the upper floors. This project draws on the several fine examples of Trier’s existing historical buildings having undergone successful and contemporary treatment and ties in with the philosophy of other properties known outside the region. City, squares, tree populations, flanked by buildings of various use; in between paths that connect. People move along these routes from place to place, lingering, a constant flow; here and there. The essential characteristics for a functioning guidance and orientation system are providing guidance, orientation, information and identification – for tenants, employees, visitors and suppliers alike. 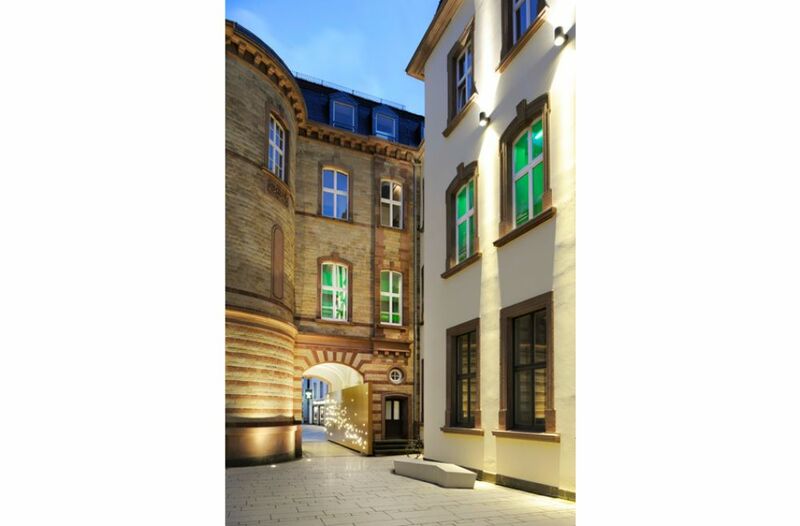 The orientation and consistency of this key information represents an absolute necessity for the main users (tenants of retail spaces, a hotel, restaurants and offices) of the former post office on Trier’s Kornmarkt, as well as for visitors to the historic building ensemble. 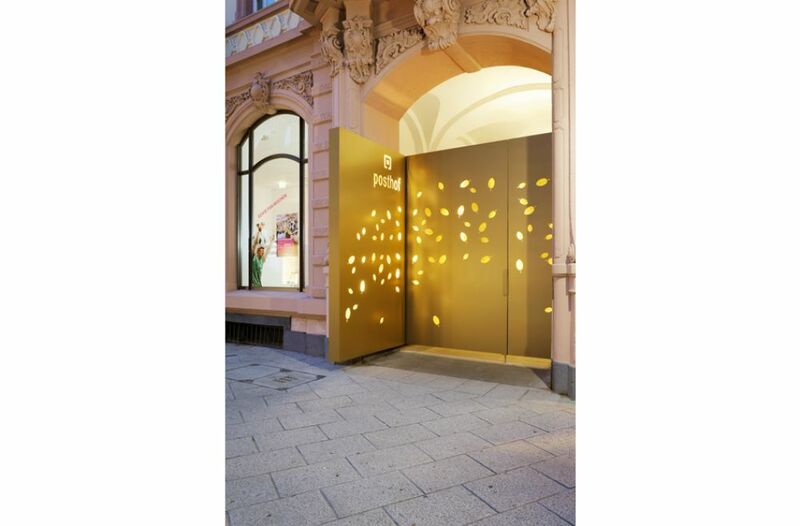 The design and improvement of visual information and routing requires a coherent and well-conceived conception from the Kornmarkt via the Posthof, located within the building structure, to the rear section of the building in Metzelstraße. The concept is based on the existing situation: the aim is to find user-friendly and practical means that are adapted to the local circumstances and regulations of the city of Trier and that are at the same time complete and respect the historic edifice with contemporary forms and a material language with an identity of its own. In accordance with the historic preservation requirements, the guiding system will be reversible. 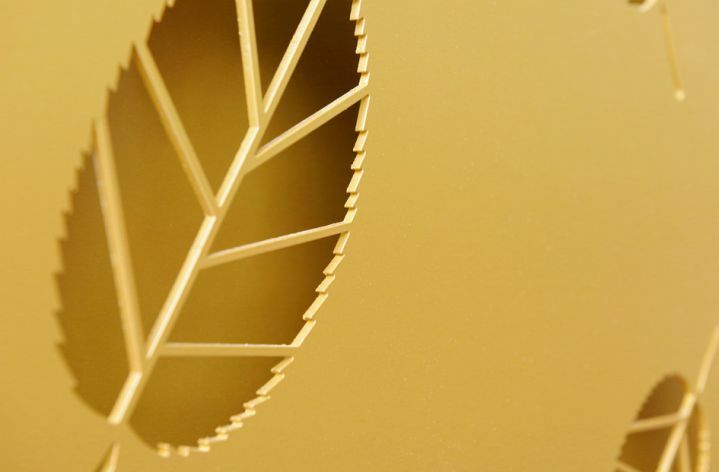 Large-sized, gold-coloured metal plates perforated with graphic patterns, inspired by the image of leaves moving in the wind, flowing towards the Posthof, were installed along the passage and at the entrance to the Posthof as a main element of the control system. 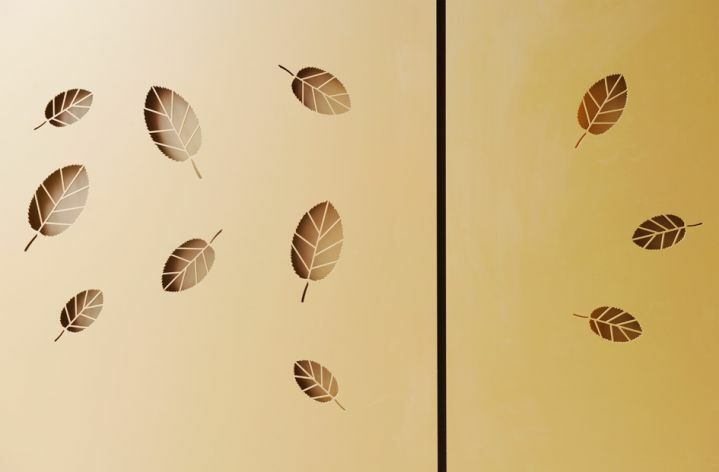 The foliage represents the leaves of the juneberry tree, which was newly planted in the courtyard as part of the exterior space design. Due to their milled shape, which creates depth, the leaves change shadows depending on the light incidence, creating different atmospheres inside the gateway. The individual spatial perception can be enhanced by the sensation and feeling of the haptic quality of the foliage. Similar to a tintype, a photographic process, this moment is thus recorded. The result is a visual correlation between Posthof and Kornmarktplatz. This element of the control system, with a height of 3.6m, forms one line with the crossbars of the window elements, whether closed or opened. 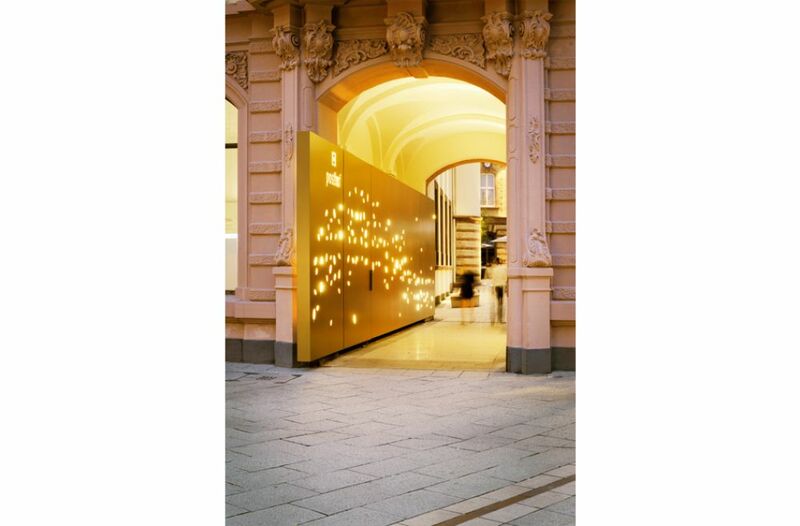 This reference guides the passers-by into the courtyard and consequently also has the required long-distance effect. When closed, the continuous line gives the eye a fixed point, connects all the elements and supports the horizontal structure of the building’s façade. 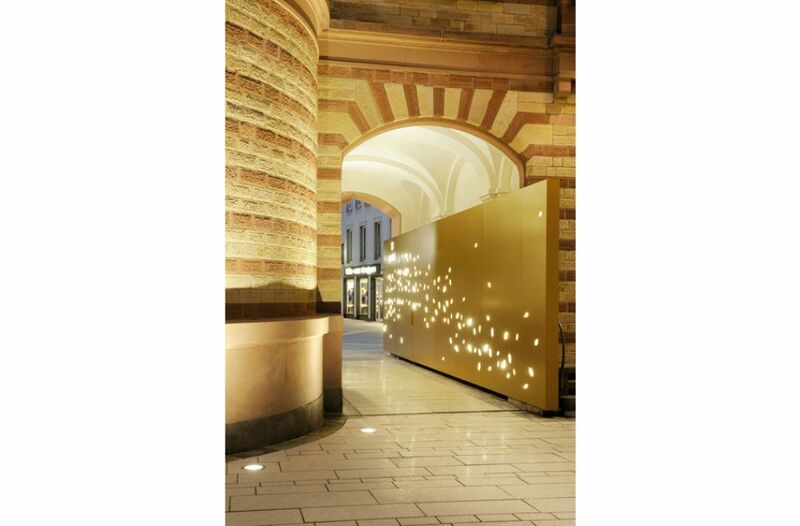 The indirect lighting stages and facilitates the movement of pedestrians in the evening; it gives the passage into the Posthof its desired presence and stimulates communication between the building and the user.